Here it is, finally, a spring WB, called "Its Spring", it's light in color, and have you're spring colors. 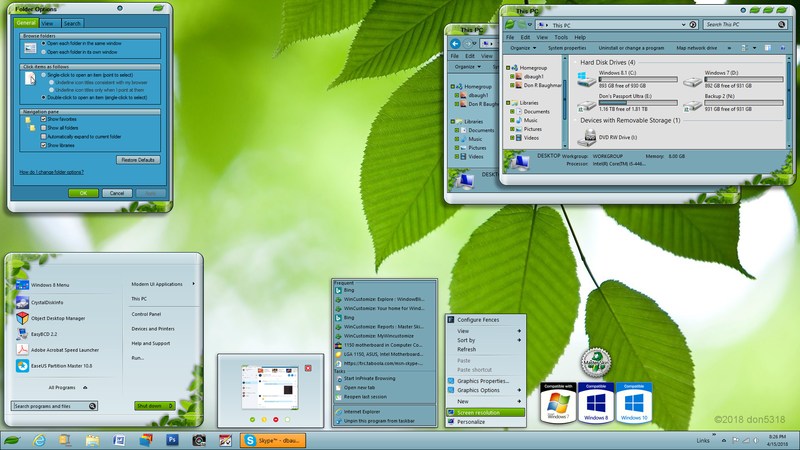 It has sub styles for Win 7, Win 8, Win 10, light/dark Explorer backgrounds, and a roll up button too. The wall paper I got from Microsoft Desktop Themes, called "Forests" I'm sure you can find other walls with spring colors to your liking. Enjoy, and hope it will bring a little spring into your life. Still waiting for spring here, but looking this sure helps! Great design Don! Thanks Tom. Sorry bout your weather Tom, but glad this helps a little. Don, how could you spring this on me on a snowy day? I love it, something to look forward to! Don, how could you spring this on me on a snowy day? I love it, something to look forward to! Great blind Don......makes me wanna plant some flowers and sip on some sweet tea! Love it. I'm loving this theme! Very well done! I don't see any flaws in it. It's such a nice Spring theme! Thanx for the great skin !